Many prospective patients who live or work near Worcester County, MA associate braces with awkward teenage years. However, orthodontics knows no age limit. Anyone from the age of 6 or 7 to 100 can get braces and the picture perfect smile they wish for, if they meet a few requirements. While anyone between these ages can get braces, their teeth need to a be developed to a specific point in order for braces to be effective. Dr. John Walker from Walker Orthodontics is here with some tips to tell about what age your child will need braces in Worcester County, MA and should start treatment. While orthodontic treatment can start in patients as young as 6, there are a few specifications which need to be met. It is less about what age one can get braces as at what age they are ready for braces. Each child’s teeth develop differently which makes the age for children getting braces differ as well. However, here are Dr. Walker’s indicators as to when your child might be ready for braces in Worcester County, MA. Has your child lost all of their baby teeth? When someone gets braces, all of their teeth are shifted to align to the perfect smile. If all of these teeth are not adult teeth, it can be difficult to align. It can also be more painful later on if a tooth is lost and an adult tooth is trying to grow in around the braces. While it is possible for orthodontic appliances to be started when a child still has all of their baby teeth, Dr. Walker recommends waiting until the child only has adult teeth so that they can all be aligned together. Have their molars grown in yet? Like with baby teeth, it is easier for braces if all of the adult teeth have grown in already. If molars are not grown yet and are growing in while a child has braces, it might be painful when they grow in and try to grow around the brackets. To add to this, if molars are already grown into your child’s mouth, the molars can be aligned with the rest of the teeth which equates to a straighter smile at the end of treatment. Are there any serious problems in the mouth? Around the age of 7, the mouth is usually pretty well developed and baby teeth are beginning to fall out to make room for adult teeth. Dr. Walker suggests to schedule an appointment with Walker Orthodontics around this time so your child’s teeth can be evaluated. While this list is a good indicator as to when your child will be ready for braces, Dr. Walker is the only one who can truly evaluate your child’s teeth and see if there are any problems which will become bigger in the future or if your child’s teeth are at the right time for braces. Has your child met with an orthodontist? 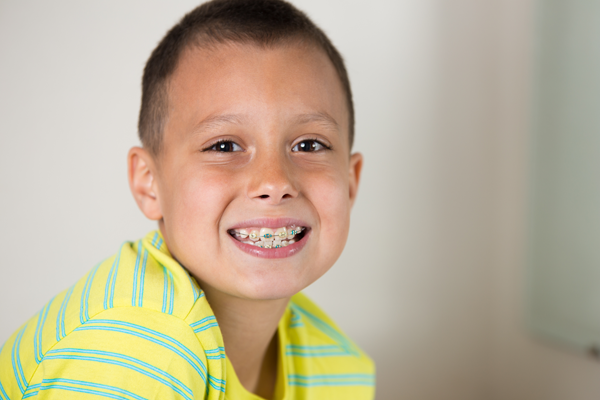 If your child does not meet with an orthodontist, he or she is not ready to get braces. Walker Orthodontics can give a full review on your child’s teeth and determine what type of braces would be best and when the ideal time to start treatment would be. While anyone from the ages of 6 to 100 can get braces in Worcester County, MA, each individual child and their teeth are different and therefore begin treatment at different times. Dr. John Walker and Dr. Liz Walker of Walker Orthodontics in Worcester County, MA are happy to consult with each patient individually to figure out when the best time to start treatment would be. For more information or to schedule an appointment, visit our office or contact us at (978) 345-7988.